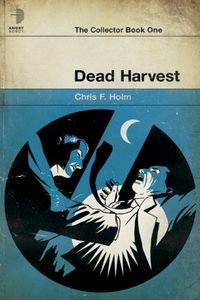 Dead Harvest by Chris F. Holm, a Mysterious Review. Review: Sam Thornton has been dead for 65 years. Today he wanders the earth as a soul collector, capturing the very essence of the evil in a person, burying it where it can never be found again. Of course the person dies in the process, but that's the way it works. He's very busy … and he's always completed an assignment. Until now. He reaches in take the soul of a young woman accused of brutally murdering her family and experiences something he's never felt before, and decides to let her live, putting them both in danger in Dead Harvest, the first mystery in this series by Chris F. Holm. The woman's name is Kate MacNeil and she's in a coma when Sam first meets her. When he decides to forgo his assignment, he whisks her out of the hospital to a safe location, where she awakens and professes to remember nothing about the night she killed her parents and brother. Sam isn't sure she's telling the truth but he knows — or at least strongly believes — that Kate isn't evil … at least not the kind of evil that he's seen as a Collector. And though he has no authority to do so, he sets about to determine if a mistake may have been made in deciding that Kate's soul should be taken from her. Dead Harvest is probably best characterized as "urban fantasy", though there is a strong whodunit element to the story. The characters are well drawn and interesting, with the lines between good and evil, right and wrong, very blurred. Just as there can be good criminals and bad cops in other mysteries, Sam Thornton is a good bad guy in this story. And there are bad good guys as well. One's enjoyment of the book requires a certain buy-in to an alternate set of rules that are never quite spelled out. For example, the angels and demons here — Sam is one of the latter — have no physical being and must assume a living — or dead — person in order to interact with those in the "real" world. All well and good. But as a "real" person, they also seem to possess supernatural powers, being able to instantly transport themselves and manipulate objects with their minds, yet often have trouble with the most mundane tasks. It's probably best not to overanalyze all this and just go along for the ride. As a mystery, the storyline is familiar but well structured, expanding the parameters of a fairly routine whodunit plot to fit the alternate reality world in which Sam Thornton exists. With its blend of elements from traditional crime fiction and urban fantasy fiction, Dead Harvest will likely satisfy new readers of either or existing fans of both. Acknowledgment: Osprey Publishing provided an ARC of Dead Harvest for this review.